760 Clear Lake City Blvd. A pushmobile is a youth-powered go-cart. Cub Scout dens make their own pushmobile. Six Cub Scouts work together as a team to push their pushmobile through the course to the finish line at this annual district event. Registration is typically done by the den leader and is completed online with credit card, electronic check or PayPal. Dens will race as teams. Individuals or groups of less than six Cub Scouts will be combined with other dens to form a team. Substitutions are allowed. Patches are not guaranteed for late registration. Council refund policy. Please read all rules as they will be strictly enforced. Onsite Registration $15.00 per Cub Scout. Checks only, payable to SHAC. No patch. Please designate one adult to register/check-in at the registration table for the entire den, and one adult to take the car through inspection. The rest of the team should meet in the pit area for each rank. One adult from pre-registered teams must still check-in to pick up patches. Notice! Please be advised that promotional videotaping/photography may be in progress at any time at an event. Your entrance constitutes your agreement that the district has the right to reproduce your likeness in videography/photography for promotion (e.g., publications, internet, newspaper). Please read all the rules carefully and ensure that all racers are fully informed of the rules. Each course will consist of two (2) lanes marked in three (3) segments. The width of each lane will be one or two parking spaces wide depending on the available space at the college. Each segment is approximately 20-30 yards in length. 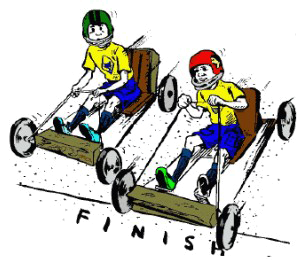 Two Cub Scouts will be stationed at the start of each segment - one Cub Scout will be the driver and the other will be the pusher for that one (1) segment. At the halfway point, the car will be turned around by the Cub Scouts and the Cub Scouts will reverse their roles as driver and pusher. Winners of each race will be announced and the winners will continue until there is a final winner for each rank using the double elimination system. If the team has Cub Scouts from multiple ranks, the highest-ranking Cub Scout will determine rank for the team. Each car will be checked for length, width, front end and steering compliance specifications as outlined above. Cars shall remain in the pit unless instructed to move to the race line by a race official. The six Cub Scouts who start a heat must finish it - no substitutions are allowed during a single race. All six Cub Scouts must be pusher AND rider with the riders becoming the pushers on each segment of the return trip after the car is turned at the end of the course. Every team must have its own car (cars cannot be shared among teams). Teams should designate an adult to assist with the staging.One adult is allowed at the start line, one at each of the handoff points and one at the turnaround (end of the track).The adult at the starting line is solely responsible for telling the judge that the team is ready.The other adults (handoff and turnaround points) can instruct the racers but may not physically help.The team will be disqualified if an adult touches the car or Cub Scouts during the race. There will be no spectators at the start/finish line or alongside of the track. 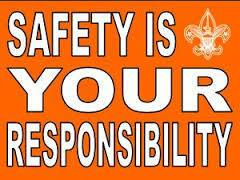 This is for the safety of the team and the spectator. Adults may not run in the lanes, sidelines, or touch the cars. Both axels of the car must completely cross the end line before the car is turned around. Cars must stop with wheels within five feet of the exchange lines. The judges will disqualify teams who exchange too far away from the line. Cars should not cross over the sidelines. Minor crossovers on the sidelines will not be subject to disqualification.However, judges will use their discretion to determine disqualification of teams who are steering out of control or in an unsafe manner. Races will be run double elimination. If a team misses its race, the race will not be rerun. Keep in mind that it is possible for a car to lose its first two races and be eliminated at that point.In order to avoid having a disappointed Cub Scout, if a team has more than six Cub Scouts, the rotation needs to be set up so that all Cub Scouts get to participate by the second race. Any disputes about what lane a car is to run in will be resolved with a coin toss. First Heat All cars should line up in two lines in their ranks pit area in any order. After each race, winners go to the back of the line on the right side, and the losers go to the left side. Second Heat At this point, each car will have either (1) win or (1) loss. Two winners from first heat race (right side line) race against each other followed by two losers from first heat (left side line) until all cars have raced through this second time. Cars with (2) wins to the back of the right line. Cars with (1) win/ (1) loss go to the back of the left line. Cars with (2) losses are eliminated. Third Heat Alternate cars in the right line with (2) wins racing against each other followed by cars in left line with (1)win/(1) loss until all cars have raced through this third heat. Subsequent Heats Cars will have a number of wins (depending on how many races they have run) and either no losses or one loss. Adults need to help the starter by pairing up with another team at the end of the line with the same win/loss ratio. Teams that have run fewer total races should race first to ensure they are running the same number of races as everyone else in their rank. Do not stand back to try to keep from running fewer races. Your team will have to run an extra race to be on the same playing field as everyone else. A Scout is trustworthy. The pushmobile is to be made by Cub Scouts, parents, and leaders. Steering will be done with both hands and feet using a rope fastened to the front axle and feet resting on the front axle. No other steering method will be permitted. Wheels must be secured with cotter pins, double nuts, or lock nuts. Construction: cars need to be made of wood, assembled with screws or nuts and bolts. No nails will be permitted on any part of the car and no cars made of pipe of any kind. Seat: must have a sturdy seat with a backrest (seat belts not required or recommended). Push bar: must be installed at back of the pushmobile high enough for the Cub Scouts to push comfortably and far enough back so the Cub Scouts will not trip over rear axle while pushing. If the push bar is made of pipe or tubing then the ends must have safety covers. Check the internet or the Cub Scout How toBook for ideas. For late-breaking news and announcements will be emailed to those registered, post on our district Facebook page and sent to the district email newsletter list. Join our district Facebook page and sign up for our district e-mail list. For questions, contact Molly Benitez or Raul Benitez. For questions, contact the Pushmobile chair or district activities chair.